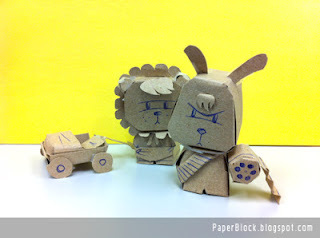 PAPER BLOCK: Papercraft - WoWo go Roar! With an old brown folder and spare time after office hour, a simple papercraft of "WoWo go Roar!" is made. The story 'WoWo go Roar!' roughly came together a couple years back. It's about a baby lion being dressed as a full grown to better protect himself while looking for his lost parents, with his shrunken friend who has a chain-gun on his left arm, looking for a way to scale himself back to normal... as their journey goes on, the ironic dependency relationship gets developed between the two... can't sound lamer than that. I haven't give it much thoughts after, so story remains. I love the story!!! My eyes got teary from reading it!! Literally!